You want to be a difference maker and teach others how to respond to an active shooter event. You’re committed to the mission of saving lives but…….you find the general administrative duties such as paperwork, grading tests, scheduling classes, and ordering training materials requires more time at the desk than it does conducting the actual training. ALICE Instructors know they can depend on us to efficiently deliver the classroom portion of the training via our interactive e-Learning product. This allows Instructors to focus on the next step in the blended learning approach and provide in person, interactive practice drills. 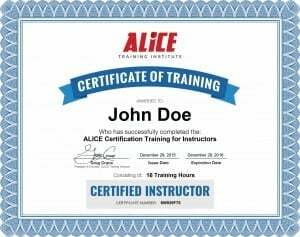 An ALICE Certified Instructor is an individual who has demonstrated mastery of the (2-day) program through an online test and graded presentation. It is not guaranteed that all participants who attend the Instructor training will achieve certification. Only Certified ALICE Instructors can facilitate the ALICE training program within their organization. Instructors, through their organization, must provide each training participants with access to the online training materials (electronic textbook) as part of the training curriculum. This allows the instructor to focus on higher level, site specific training and the facilitation of example scenarios and drills. Qualified instructors may come from all levels of an organization including CEO’s and front line staff. Instructors should be the best front line advocate for your safety training program including those who: want to take an active role in workplace safety; have experience in training adult learners; or have a law enforcement or safety background. Once certified, instructors must refresh their training every two years using our online recertification course.